I recently clicked on a link to Duck running back Thomas Tyner‘s Twitter account. I read the part that went with the article I had been reading, then scrolled down to Valentine’s Day. He’d tweeted about going to Zany Zoo. Nate McClain, owner of the popular Eugene pet store, Zany Zoo, recognizes that most University of Oregon athletes are 18-22 years old. So, even though they seem larger than life on the field, they need down time, like others of their age. Nate lets them play with the animals at his store. He also has a weekly Saturday petting zoo that attracts people of all ages. 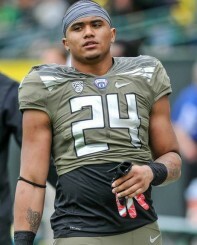 Thomas Tyner is an animal lover. 24 seems to be a good # for that! Over the years, a lot of football players have come to the store. D’Anthony Thomas bought a kitten and purchased pet food. Pharaoh Brown bought a puppy. Colt Lyerla loved to play with the lemur. Last year, Andre Yruretagoyena and Stetson Bair came in a lot, as did roommates Thomas Tyner and Kani Benoit. They purchased a leopard gecko and a chinchilla. Charles Nelson came in looking for a sugar glider, but the store didn’t have any available at the time. Many players have posted pictures of their pets on Twitter. In August, 2012, James Harris was a U of O athletic advisor. He asked Nate to set up a petting zoo in the large hallway near the cafeteria of the Casanova Center. It was the last day of fall camp and just that morning, Chip Kelly had made the announcement that Marcus Mariota had won the starting quarterback job. 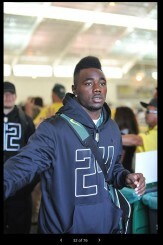 Kenjon Barner likes boa constrictors. Kenjon Barner really liked the boa constrictor and asked if he could take it to “show some friends”. Nate let him do it, but warned him not to scare people with it. Kenjon didn’t come back for about an hour. Some of the players laughed when they heard that the giant tortoise’s name was “Mondo”. They thought it sounded like “Mana”. It turned out that lineman Mana Grieg was a huge fan of turtles and had a sea turtle tattoo. Chip Kelly isn’t fond of reptiles. Chip was standing in the middle with some people. Nate was at the reptile end with an Albino Python wrapped around him. Suddenly, there was a crisis. Someone holding the Bush Baby got too close to the Amazon Parrott. The Bush Baby started to attack the bird. Nate hurried to rescue the parrott. 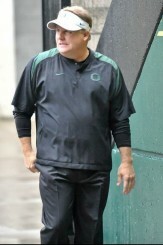 Chip Kelly, looking up as Nate zoomed by, let out a yelp when he saw the python. Chip must have forgiven James Harris for setting up the petting zoo, though, because he took James with him to Philadelphia. Scott Frost and his daughter played with the tarantula for quite a while. They had a great time. The next February, Nate took a Burmese Python to the Lane County Boys and Girls Club to celebrate the Chinese New Year’s “Year of the Snake.” As many of you know, a lot of Duck football players do volunteer work there. The two huge linemen who were helping that day backed away, because they were afraid of the snake. Nate’s son and daughter were with him, and the girl, who was 3 1/2 at the time, picked up the python — it was larger than she was — and wrapped it around her body. One of the linesmen asked Nate to send him a picture of the girl and snake, so that he could have it on his cell phone. In 2015, Zany Zoo has put on a petting zoo at three U of O athletic events — Women’s and Men’s basketball games and a volleyball match. This has brought more U of O athletes and other students to the store. Nate feels that part of the reason the footballers come in is because they’re “Men of Oregon” and, as such, they need a place to stay out of trouble and hold themselves to a high standard of conduct. Zany Zoo is a safe place where “U of O athletes and regular students are coming to blow off steam and have fun.” We hope the Ducks will continue to flock to the zoo and other “safe places,” because we’re glad they take “Men of Oregon” seriously.